Sometimes I feel like I don’t exist. Like I’m a ghost that nobody can see or hear. This happens often in Paris, mostly when I am being ignored by an overly busy café waiter, but especially when I go on my morning run at the Champ de Mars. It’s amazing to me, but there seem to be two parallel universes in that park. 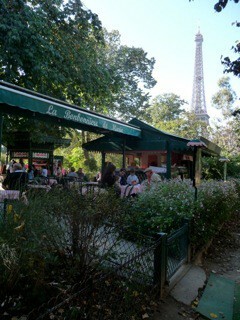 The tourists come to stroll, picnic in the central area and of course, climb the Eiffel Tower. They are out there in full force, yet never have I seen them stop to photograph the local scene. And what a local scene there is! The streets surrounding the Champ de Mars are some of the most exclusive in Paris, full of local families and this is their local playground. One of the unique aspects of Paris housing is that these lavish buildings were built with staff in mind, but very few can afford an army of maids these days, so the smaller, less airy flats become housing for students and immigrants and others on a tight budget, making for a diverse, lively neighborhood scene. 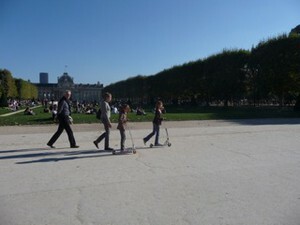 The Champ de Mars, in the shadow of the Eiffel Tower, is where locals go running, teach their children to ride a bike, take grandma for a stroll and walk the dog. 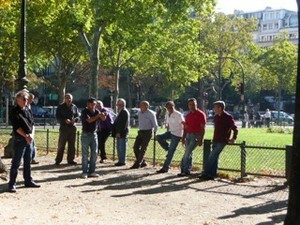 Along the western side of the park you’ll see several groups of local men playing pétanque, while others set up chess games and card games as their wives stand nearby chatting and running after the children. To the east, about halfway between the Eiffel Tower and the Ecole Militaire there is an entire area dedicated to young children, with go-carts families can rent for their kids to race around a track, a merry-go-round, pony rides, and even a regular guignol puppet show that makes kids laugh no matter what language they may speak. There is a hard-to-spot little playground with a crêpe restaurant called La Bonbonnière de Marie (Marie’s Candyshop), featuring red-checked tablecloths and the Parisian-green metal yard furniture nestled into the shade of the towering chestnut trees. To the west of the park, near the Peace sculpture, there are more, larger playgrounds. This area does see more visitors, perhaps because it is easier to spot. Directly adjacent, you’ll see courts for pick-up basketball games and asphalt soccer games, perfect for your older teens and men. France still has its Latin roots, so you see few women playing here, but you will see them running round and around the Champ, enjoying the wide allées between the trees. On warm Sunday afternoons, the park is at its best with locals of all ages out and about. I’ve seen entire rows of businessmen, shirts off, sunglasses on, highlighter out as they review some professional document, just as oblivious as the rest of us to all the life seething around the Champ de Mars. For more irresistible finds in Paris please consult the Girls’ Guide to Paris. 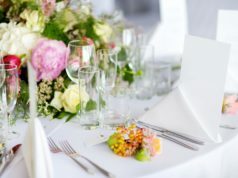 If you’re coming to France and want to remove the stress out of any and all planning, dynamo Lisa Buros-Hutchins of www.YourParisExperience.com can arrange anything and everything, including planning your honeymoon and/or making dinner reservations. Nothing is beyond her. 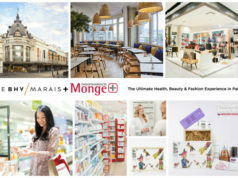 Say Bonjour Paris referred you and put her to the test of making your stay in France perfect. To take your own photos, this camera has received terrific reviews. National award winning photographer, Sylvia Sabes took to the keyboard when she immigrated to Paris with her two young daughters in 2002. 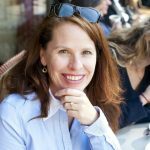 The San Francisco native is the author of the Paris LUXE City Guide, a Local Expert for AFAR magazine and writes about Paris for Luxos magazine, WOW airlines, as well as a variety of online publications. When notauthor writing, Sylvia can be found somewhere on the globe with her Mr French, exploring art galleries, observing wildlife or sneaking into somebody’s kitchen. 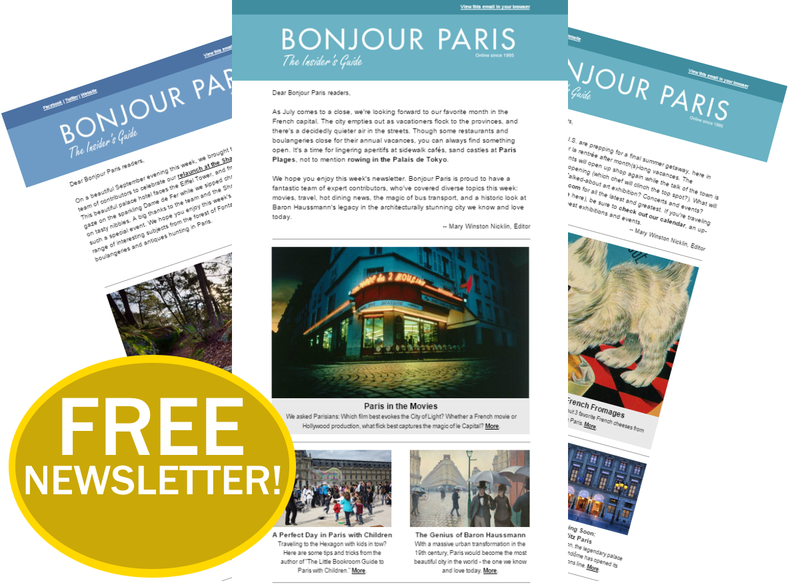 Visit her Facebook page for regular Paris updates.